← Who’s a pretty boy, then? There’s no doubt about it – terns are among my favourite birds. In Wales, the place to be for the tern-watcher is the Isle of Anglesey, and it was here that I headed late last week. There are a number of colonies on the island, and – with the exception of the little tern – all the British species can, with good fortune, be found there. Common terns are present near Menai Bridge, and they are a delightful sight above the sheltered waters of the Straits between the two bridges. There a number of mixed colonies elsewhere. Perhaps the most well-known is at Cemlyn, on the north coast, where sandwich tern is in the majority together with common and arctics. This is also an ancestral breeding site of the very rare roseate tern, and very occasional birds may still be seen there, including – to my delight – last Friday, when I visited. Not that I would have picked it out amongst the throng of other terns without the assistance of the Wildlife Trust wardens! The tern island par excellence is/are the Skerries, with its lighthouse and colony of several thousand arctic and common terns. For the last few years a roseate tern has paired with a common tern on the island as well and produced hybrid young. During spring and summer the colony is wardened by the RSPB, and it was thanks to them that I was able to visit the island on Friday evening on their regular supply vessel. Visiting a tern colony really is an experience. 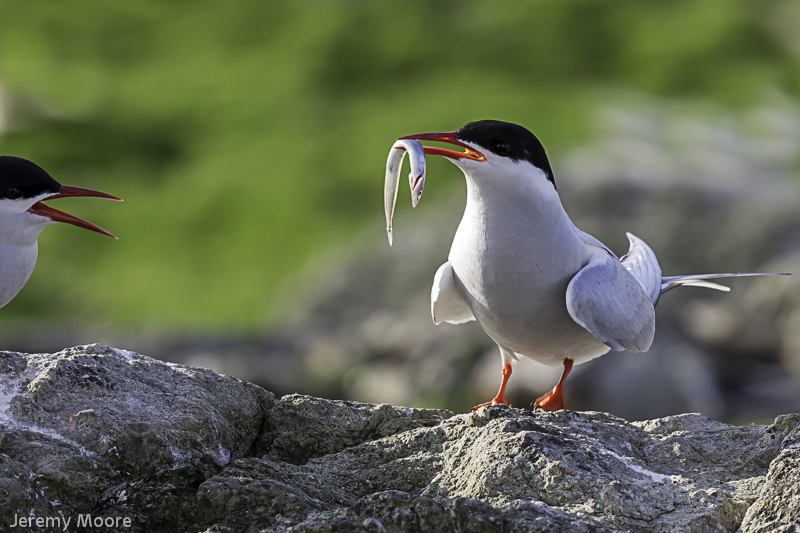 Arctic terns are stunningly beautiful little birds and can be exceptionally approachable. With their bright red beaks and legs a bird can recall a woman decked out in red lipstick and boots. But move one inch too close and that bird can become a tiny raging little monster, metaphorically spitting blood. They have no hesitation in striking a human intruder on the head so wearing a hat is a necessity. On a previous visit in June 2010 I found that a telephoto lens was unnecessary as the birds were so close. I stuck to my standard zoom, and told myself at first to be selective when pressing the shutter; still thinking ‘film’ I suppose. After a while I remembered that I had just one hour on the island and how desperate it would be to get back to the mainland with nothing, so I relaxed a little. I got some great images of angry terns in flight at the wide-angle end of the zoom; and one of these featured in the book and exhibition Wales at Waters Edge. On last week’s visit conditions were slightly different. Weather conditions were excellent but much of the closest section of the colony was in the shadow of the lighthouse. It was about two weeks earlier than my previous visit and the birds seemed slightly less territorial than I remembered. Every few minutes, it seemed, the whole colony rose up together and swept across the island before quickly returning. I stuck the Tamron long zoom on my 5d3 and concentrated on close-ups of individual birds, and – despite the incredible experience of being there – my photographic efforts felt strangely uninspired. The warden asked us all if we could be ready to leave in five minutes, so I swapped lenses and packed my gear away. Turning around, I saw a perfectly-lit bird perched on a rock with a sand-eel in its beak – a cracking image if only I had seen it earlier! Unless…………..
To my surprise it continued to pose for me as I re-fitted the long zoom and took a few images. What a little hero! This entry was posted in Uncategorized and tagged Anglesey, arctic, cemlyn, common, roseate, Skerries, tern. Bookmark the permalink.